The L118 Light Gun is a 105 mm towed howitzer. It was originally produced for the British Army in the 1970s and has been widely exported since, including to the United States, where a modified version is known as the "M119 howitzer". From 1961 until the mid-1970s, the British Army used the 105 mm pack howitzer L5 with L10 ordnance (OTO Melara Mod 56) as its light artillery weapon, variously replacing the 75mm howitzer, 4.2 inch mortar and 25-pounder gun in some eight regular artillery regiments. It fires the US M1 type ammunition (called "105 mm How" in the UK). The Mod 56, a widely used howitzer, was originally designed in Italy for the mountain artillery units. It is light enough to be lifted by Westland Wessex helicopters or towed by Land Rovers. It could also be dismantled into several separate pieces, none heavier than 128 kg, to be transported by mules or horses. However, it lacked range (making it potentially vulnerable to counter-battery fire), was not notably robust, had poor sights and was not entirely popular. Nor was its rate of fire and time to prepare for opening fire satisfactory. In 1965, a general staff requirement was approved for a new 105 mm weapon system because the pack howitzer "lacked range and lethality". Key characteristics included 6400 mil (360°) traverse by one soldier, maximum weight of 3,500 pounds (1,600 kg), dimension limits imposed by internal carriage in new Chinook helicopters and Andover transport aircraft, and the ability to fire immediately after being under water for 30 minutes. The ammunition to be used was the 105 mm Fd Mk 2 ammunition used in the L13 ordnance of the gun equipment 105 mm L109 (better known as the "Abbot self-propelled gun"). This ammunition uses electrical instead of percussion primers and is an entirely different design from the US M1 type ammunition as used in the L5 pack howitzer. The two types are not interchangeable. An early requirement was for the new weapon to use 105mm Fd Mk 1 ammunition, which uses the M1 shell, in training. However, in 1968, this was changed to allow a different version of the weapon, which subsequently became the L119, to fire US 1935 pattern (i.e. M1) ammunition. The new gun, soon designated 'light gun', was designed by the government Royal Armament Research and Development Establishment (RARDE), Fort Halstead, Kent. Prototypes were tested in 1968. However, it soon emerged that some increase in weight was needed for a gun with the requisite robustness, and several assemblies were substantially redesigned. Original production, which was authorised in late 1975, was by Royal Ordnance Factory, ROF Nottingham, which has since been incorporated into BAE Systems Land and Armaments. Deliveries started in 1976. The light gun entered service with the British Army in 1976. The new weapon was heavier than its predecessor, but new and more capable helicopters such as the Puma and Westland Sea King, which could carry the new weapon, were entering service at the same time. A new vehicle, the Land Rover 101 Forward Control ("Land Rover, one-ton", was designed as the prime mover in the field for the light gun (and the Rapier air-defence missile launcher). Since the end of the 1990s, the British Army has used Pinzgauer ATVs as their gun tractors. In Arctic service, and elsewhere, the gun is towed by the Hägglunds Bv 206 and is fitted with skis when over snow. In 1982, the light gun saw use in the Falklands War. Five batteries (30 guns) were deployed to the Falkland Islands. During the final phases of the battles around Port Stanley, these guns were firing up to 400 rounds per gun a day, mostly at "charge super", the most powerful propellant charge for which they were designed. 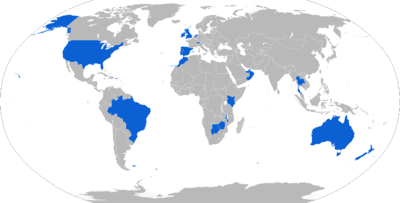 They were a significant factor in the British victory. Since then, British forces have used the light gun in combat in the Balkans, Sierra Leone, Iraq and Afghanistan. 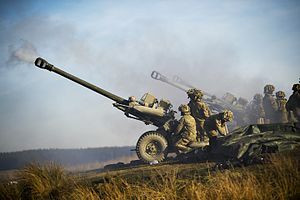 At present, the British Army has four light gun regiments: 3rd Regiment Royal Horse Artillery, 4th Regiment Royal Artillery, 7th (Parachute) Regiment Royal Horse Artillery, and 29 Commando Regiment Royal Artillery. Other regiments are temporarily equipped with it for service in Afghanistan. The 14 (Training) Regiment Royal Artillery uses it for training at the Royal School of Artillery. Three regiments of the Army Reserve, The Honourable Artillery Company (HAC) 103 (Lancastrian Artillery Volunteers) Regt. RA and 105 Regt. RA) are also equipped with the light gun. Those University Officer Training Corps with "gun troops" train with the L118. On 30 November 2001, an L118 light gun replaced a 25-pounder as the One O'Clock Gun in Edinburgh Castle. By tradition, this fires every day at one o'clock, except on Sundays, Good Friday and Christmas Day. The light gun is also fired by 14 (Training) Regiment Royal Artillery on Remembrance Sunday and Armistice Day each year. As of July 2017, there were 126 L118 light guns in service with the British Army. The L118 uses the L19 ordnance on the L17 carriage. The L19 ordnance is slightly shorter than the L13 used by the Abbot and hence has a slightly shorter maximum range. Also, unlike the Abbot, the barrel is autofrettaged and hence lighter. The light gun appears to owe a number of its features to the QF 25 pounder, unsurprisingly since RARDE was the successor to the design department, Woolwich Arsenal. Among these features are its vertically sliding block breech, and a box trail instead of a split trail; a traversing platform is normally used with it. Its comparatively light weight is also attributed to the nature of the steel used in the carriage and ordnance, and other weight-reducing features, including its narrow wheelbase. The narrow wheelbase prevents the ordnance rotating the 3200 mil (180°) required to 'unfold' the gun. Because of this, the gun features a knock-off hub on one side allowing the ordnance to be rotated by removing one wheel. With a well trained gun crew, this contributes approximately 30 seconds to the time required to deploy the gun. In British service, rotating the barrel for towing is optional. When being towed in the unfolded position, the A-frame is fitted to the front transom in order to support the elevating mass. A recent modification makes it possible to keep the gun in this position indefinitely at speeds up to 40 mph (64 km/h). For long distance transport or traversing rough terrain, the barrel is reversed and clamped to the end of the trail. For storage, the gun is in the unfolded position with the barrel elevated to an angle that balances the elevated mass on the yoke and therefore relieves pressure on the elevating gears. When first introduced in the British Royal Artillery, the L7 or L7A1 dial sight and its carrier, incorporating an integral elevation scale and internal lighting powered by Trilux nuclear light sources, was used to aim the gun for indirect fire. The L7 sight is a modified version of a German Leitz instrument. Since the light gun entered service after the introduction of field artillery computer equipment (FACE), it never, unlike the Abbot, had gun rules (large slide rule like instruments used at each gun to convert range in metres to tangent elevation in mils, taking account of muzzle velocity). Therefore, it has a single quadrant elevation scale. These optical indirect fire sights are now only used in recruit training. The guns also have a direct fire telescope and were originally issued with a night telescope using image intensification. The 105 mm Fd Mk 2 ammunition has two propelling cartridges and a blank cartridge (for saluting purposes). The normal cartridge has six propellant increments (charges one, two, three and four) plus 4½ and 5 increments. Charge 4½, which is charge five with the blue charge three bag removed, is peculiar to the light gun and is used only for high angle fire. A separate "charge super" cartridge is used for firing to maximum range. Both charge five and charge super project beyond the end of the metal cartridge case. Unlike the M1 ammunition, which is 'semi fixed' and loaded as a complete round, 105 mm Fd is 'separate'; the shell is loaded and rammed by hand, then the cartridge is loaded. By the time the L118 entered service, propellant sub-zones A and B originally used with the Abbot had been replaced by an aerodynamic spoiler (a ring slipped over the nose of shell to lodge on the ogive) to reduce the minimum range at high angle fire when this was required. L31 high explosive (HE) filled with 2.5 kilograms (5.5 lb) of RDX/TNT. Conventional impact L32, L85 and L106, L27 CVT and L33 mechanical time fuzes were originally used and some are still available. The L116 multi-role (electronic) fuze is available for operations but is due to be replaced by a new multi-function fuze L166. L45 smoke base ejection. This contains three canisters filled with hexachloroethane, which are ejected from the base of the shell in flight by a mechanical (L92) or electronic time fuze (L132 being replaced by L163). On falling to the ground, they generate dense white smoke for 60 seconds. Target marker. These generate dense orange (L38) or red (L37) cloud (produced by a mixture of PETN HE and coloured dye) bursting in the air or on impact, and are used to designate targets e.g. for air strikes. L43 illuminating. Provides a parachute flare base ejected by time fuze (L81) at about 400 metres above the ground and burns for 30 seconds. L42 high explosive squash head. Used for direct fire against armoured targets or buildings, has a base fuze with tracer. L41 PRAC. Inert practice shell used in training instead of HESH. L52 contains four canisters filled with red phosphorus smoke. L54 'black light' illumination, using the same configuration as L43, to assist observation through night viewing devices. L83 drill. An inert shell for non-firing training purposes. A white phosphorus smoke shell has never been adopted by the UK for L118. A base bleed insensitive HE shell, with a maximum range of 20.6 kilometres (12.8 mi) has been developed. During the early 1990s all UK L118 were fitted with a muzzle velocity measuring device (MVMD), a radar, and its power supply. In 2002 the British Army's L118 guns completed replacement of their optical sights with the LINAPS artillery pointing system (APS) mounted above the barrel. This is a self-contained system that uses three ring laser gyros to determine azimuth, elevation angle and trunnion tilt angle. It also includes facilities for navigation and self-survey using a global positioning system, inertial direction measurement and distance measurement. All this can be used anywhere in the world to lay the gun without external references. The outputs and inputs for APS are through the touchscreen layer's display and control unit (LCDU) that replaced the conventional dial sight and its mount. The LCDU enables the layer to lay the gun by moving the barrel until the LCDU displays no difference between the ordered firing data and where the barrel is pointing as determined by the LINAPS sensors. A capability enhancement program that started delivering improvements to UK guns in 2007 aimed at reducing weight and improving some components. Weight reduction measures include the replacement of some steel components by titanium, however, only some elements entered UK service. The MVMD is also more tightly coupled with the LCDU, reducing electrical power requirements. Around 2010, new direct fire sights for longer range use were introduced for service in Afghanistan. These comprise a sniper's telescopic sight and a new night sight. At the end of 2011, a new LCDU with a slightly larger touchscreen was ordered. It may enable data transfer from FC-BISA and include the NATO armament ballistic kernel (NABK) for direct fire shooting. The L119 variant has a different barrel (a slightly shorter L20 ordnance with a percussion firing mechanism) for firing the ubiquitous US M1 type ammunition (UK 105 mm How), giving the gun a max range of 11,400 metres (12,500 yd). In British service, the L119 was used only for training at the Royal School of Artillery while stocks of 105 mm How lasted, and the last British L119s were retired in 2005. However, the L119 is popular with many export customers who still rely on M1 ammunition. The L119 was further modified and produced under licence for the United States Army. The most recent version is the M119A3 introduced in 2013 with a digital fire-control system and GPS-aided inertial navigation unit using software derived from the M777A2. During the 1970s a third variant, with the L21 ordnance, was developed and prototypes produced. This was for Switzerland and used Swiss pattern 105 mm ammunition. It did not enter service. The Indian 105 mm light field gun appears to share many features with the UK equipment. In the late 1960s India introduced the Value Engineered Abbot variant with the 105 mm Fd ammunition; this led to the 105 mm field gun (India), which appears to have some light gun features in its elevating mass, although its platform is 25-pr like. The 105 mm light field gun is much more like L118, although somewhat heavier. In the 1990s, the gun was manufactured under licence in Australia for the Australian and New Zealand armies using mostly Australian produced components. 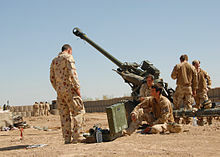 The Australian military call it the "Hamel gun". Plans to produce 105 mm field ammunition were shelved. 105 mm saluting gun: The British Army has a number of dedicated saluting guns for ceremonial purposes. Based on the standard L118, these saluting guns are modified to exclusively fire blank cartridges, are not fitted with the APS system and are easily distinguished from the field gun variant by their distinctive bronze green paintwork, chromed muzzle brake and breech. ^ "M101". Army Guide. Retrieved 5 May 2011. The article covers the M101 gun but it is stated that when the M101 is being upgraded into a 37 caliber barrel, it becomes compatible with the L118 light gun. ^ "Royal Artillery Regiments". British Army. Retrieved 4 March 2017. ^ "Summary of Army 2020 Reserve Structure and Basing Changes" (PDF). British Army. ^ "The Scottish Gunners" (PDF). The Gunner. Royal Regiment of Artillery. January 2013. ^ "UK armed forces equipment and formations 2017". Ministry of Defence. HM Government. 2017. Retrieved 6 July 2017. ^ Wheeler, Scott; Ryan, Alex (January 2005). "Weapons Effects Prediction" (PDF). DSTO Systems Sciences Laboratory. p. 3. Retrieved 3 January 2012. ^ "Hamel retired from 53 Bty". Australian Army. 6 September 2016. Wikimedia Commons has media related to L118 Light Gun. This page was last edited on 17 April 2019, at 12:05 (UTC).